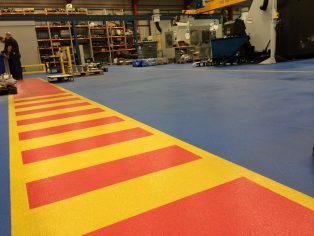 Remmers Industrial Flooring Systems have been used extensively as part of an expansion project to double the size of the manufacturing area at the Promat BD warehouse. Capeland Industrial Flooring were contracted to install 1800m2 of Remmers flooring system to the new extension that was being built to create additional warehouse space, as well as a requirement for 1200m2 of flooring to the existing machining area which was over 10 years old. The flooring needed to be durable, non-slip and resistant to oils whilst the warehouse floor required a hard-wearing, smooth finish suitable for fork-lift traffic and incorporating a DPM as it was being laid over freshly applied concrete.